Overall: The spring melt/freeze (m/f) cycle continued this week, with a bit more freeze than melt the last few days. Today 3 to 7" of snow is forecasted for treeline, where new storm/wind slab development will be possible. Light winds and accumulation, combined with post storm m/f action, may render any new slab problems non-existent or short lived. But do pay attention to snowfall amounts, wind, and bonding of new/old snow. New slabs may have a hard time bonding to cold frozen m/f crusts which have formed on all aspects. Some upper elevations ( approx. >11,000') may have a thin layer (<1") of faceted April 10th snow, possibly creating a weak layer under new accumulations. Human triggered storm/wind slab avalanches may be possible with the April 12th storm. With limited accumulation, these avalanches will likely be small. Another storm near the middle of next week may produce more storm/wind slab problems. Wet avalanches are unlikely near and above treeline during the mornings. As the days heat up, natural and human triggered wet avalanches will be possible. New snow will saturate first, possibly producing avalanches that slide on frozen m/f crusts. This week marks our first snow accumulation since March 22nd. No significant slab avalanches reported since February. Wet avalanche debris were observed recently on a north aspect of Doyle Peak. See below photo. Read more about springtime touring strategies. Backcountry conditions are dynamic, and can change rapidly, especially in spring. Pay attention to changes in snowfall, wind and temperature and how those changes affect the snowpack. Spring skiing entails monitoring overnight temperatures and what elevation freezing occurs and for how long. Saturated deep slush is indicative of wet slide hazard. Near and Above Treeline:With wind and snow in the forecast, watch for new storm/wind slab development. New snow will be the first to saturate and possibly produce wet avalanches when the sun returns. As the days heat up, natural and human triggered wet avalanches will be possible on southern aspects and any slopes receiving strong solar input. Expect to find wind scoured zones and hard icy snow above treeline. Crampons and ice axes will help prevent falls on steep icy slopes. Below Treeline:Coverage is good on most slopes above 10,000', with plenty of safer low angle (<30°) touring. Southerly and sunny slopes are rapidly losing snow as we push into spring. 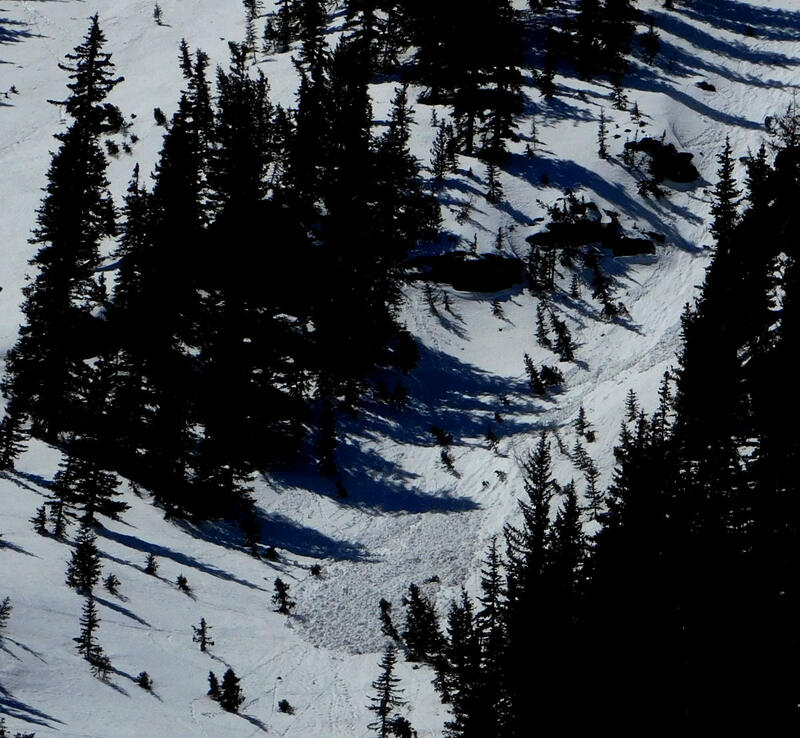 When the warm spring weather returns, wet avalanches may be possible on steeper isolated slopes where the snowpack has become saturated by a combination of sunshine and above freezing overnight temperatures. Watch for saturated, and deep slushy snow around terrain traps and any slope steeper than 30°. Wet avalanche hazard is unpredictable. Warm temperatures and consistent nights with above freezing temperatures are warning signs of an unstable wet snowpack. With wind and snow in the forecast, watch for new storm/wind slab development near and above treeline. When the sun and warmth return, new slabs will be the first to saturate and possibly produce wet avalanches. As the days heat up, watch for loose wet and larger wet slab avalanche potential. Wet avalanche debris were observed recently on a north aspect of Doyle Peak, near 10,500'. See below photo. Watch out for above freezing overnight temperatures leading to saturated and unstable snow on any steep aspect below ~10,000'. During warm weather, surface snow will become saturated with water. Deteriorating riding conditions (thick and sticky slush) and rollerballs are an indication that you should move to a colder slope or head home. Cornices have formed along ridgelines and cross loaded features. Stay away from the edges of tall and/or overhung cornices, as these may collapse unexpectedly and break further back than you may expect. See image of cornices in the April 5th summary. Avalanche debris near 10,500' on north aspect of Doyle Peak, April 09, 2019. This wet loose avalanche likely released on April 8th, when treeline temperatures pushed 50°F. Logging began along the first 1/4 mile of Freidlein Prairie Road (FR-522). Loggers will plow that stretch of road and need gate access. This is part of the Chimney Springs thinning project. Last updated Friday April 12. The past week started out feeling like summer with temperatures 5 to 8 degrees above average, however, bliss was quickly followed by a return to winter with strong winds and a sharp cool down. On Tuesday through Thursday strong winds out of the southwest shifted to the northwest with the passing of a major cold low pressure system to our north. Temperatures in the teens and wind chill below 0°F were recorded. Snow showers were observed, but only 1" accumulated at upper elevations. On Friday and Saturday April 12 and 13, a significant cold front will brush by to the north, potentially delivering 3-6 inches of new snow and a continuation of windy, cold, unsettled weather. Following this event is a slight warming trend, however, the weather will remain unsettled early in the workweek, with cool nights, warmer days and gusty afternoons. A possibility of snow showers is foretasted through Tuesday April 16. Snow accumulation will probably be light, but storm trajectory and strength are uncertain at the time of publication. On Friday, April 12th the Inner Basin SNOTEL site (Snowslide) reported a snow depth of 48” (121 cm) at 9,730 feet. Arizona Snowbowl reported a settled base of 88” (224 cm) at 10,800 feet. So far this winter, 328” (833 cm) of snow has fallen at the mid-mountain study site. Since April 5th, SNOTEL temperatures have ranged between 18°F on April 11, and 62°F on April 8. At ASBTP (11,555'), temperatures reported over the last week were between 12°F on April 11, and 50°F on April 8.